Mark Behnke at Cafleurebon just posted a review of the new Spiced Citrus Vetiver on Cafleurebon, and they are hosting a drawing for a 17 ml bottle in celebration of the release. You can head on over to enter the drawing. I’m glad Mark liked the final version. Since the earlier version he’d tried, I reduced the spices, split the vetiver into two components (EO from Sri Lanka and CO2 from Indonesia), and reduced the jasmine a tad. His nose was right on the money with the changes I’d made (the biggest change was softening the spices), and I’m glad he liked it. I still need to put out a newsletter announcement about the release and will get to that soon. Also, thank you, Amy, for the reviews of SSS scents! I’m so glad you’ve found a number you like. Best wishes with grad school! I’ve been working on some new blends and evaluating some new materials. Sourcing new ingredients is one of the most fun aspects of this job. I tried an interesting co-distillation of pine and cedar that smelled much better than if you mixed pine essential oil with cedar essential oil. The pine took on a green needle note sort of like hemlock or fir, and it interacted with the cedar to make more than the sum of its parts. There’s a nice review of Incense Pure today on The Blackthorn Orphans. I like Kelly’s beautifully written thoughts about how the appeal of incense scents relates to our connection with the natural world. I also like the (unrelated) photo of the gorgeous little New Zealand Bellbird. If you will be in the Los Angeles area on June 22, you might check out a pop-up shop of small indie and artisan perfumers at an event called FRAGments. West coast perfumers are looking for ways to get together and meet with customers. This will be the first in a planned series of pop-ups in southern CA, northern CA, and the Oregon/Washington area. I won’t be taking part in this one, but you’ll recognize many of the indies involved. If you missed Suzanna’s Timeline post on Bois de Jasmin, it is worth a read. It’s a well-written account of some of the perfumes she wore through the years, tied to important memories and stages of life. Makes you think about your own fragrance timeline. Le Labo just released a San Francisco exclusive, Limette 37. Since it was created for SF I will have to try this one! Today we made a list of all the entrants in the drawing and assigned numbers 1-49 to the 49 entrants. Then I had random.org generate a list of numbers from 1-49 in random order. The winning numbers (the top of the randomly generated list) were 32, 27, and 9. Those numbers correspond to Laura, Tiara, and CM. The three of you can send me am email at info@sonomascentstudio.com with your sample choices and your address. Feel free to ask questions if you need help deciding on samples. You can pick any four 1 ml samples or if you prefer, I’ll send a 3 ml mini spray of one of the all-natural scents and a 1 ml sample of the other. If you’re new to my line, the 1 ml samples make the most sense. Laura, since you are sensitive to synthetics we might want to talk about the best choices for you (Cocoa Sandalwood and Spiced Citrus Vetiver are all natural, and Incense Pure and some others are the next highest in naturals). Thanks so much for taking part! And congrats to the winners! Just wanted to let you know that I’ll close the sample drawing at 10 am on Wed the 15th, in two days. I’ll announce the winners by the end of the week. Also wanted to say thank you to Dionne for including Jour Ensoleillé in her list of top spring/fall scents on Australian Perfume Junkies (it was in the fall selection, which makes total sense to me). Happy Mother’s Day to the Moms! My parents got a slide scanner for Christmas and have been scanning some of our old family slides. I found a couple photos of them in the days before my brother and I came along. It’s fun to see photos of those early times. The very oldest slides have some scratches but are still usable. I found a few of Mom and Dad with me not long after I was born. 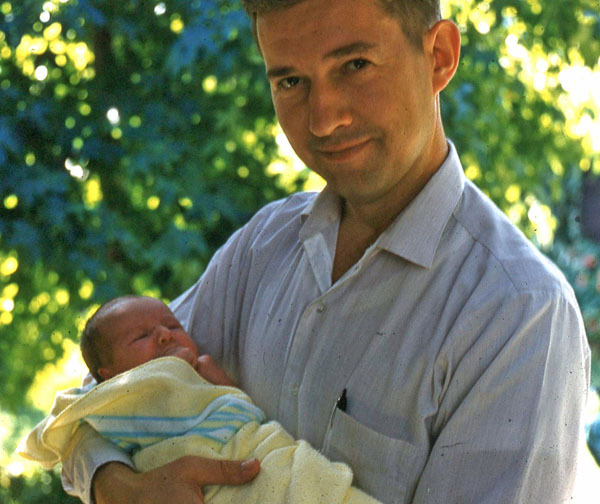 You can’t tell from the early baby photos, but my brother and I got blue eyes and lighter hair than my parents, which made my Swedish grandparents happy. 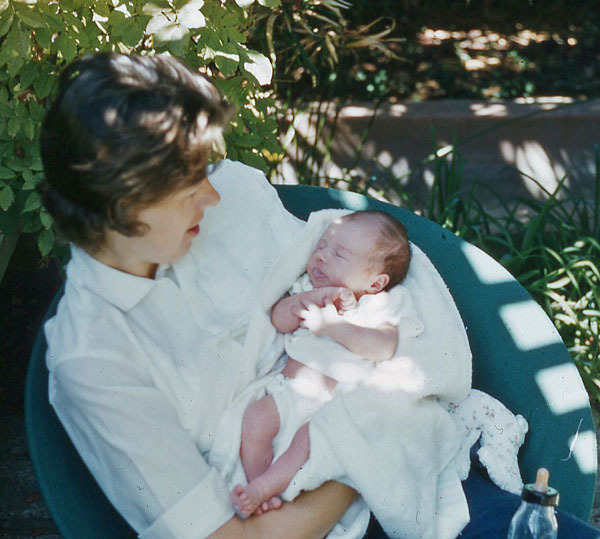 My parents were living in Palo Alto when I was born, and these photos were taken in their backyard. They are sweet pictures. Here’s a photo of my brother and I when we were little, showing how our coloring turned out to be different than that of our parents. We are all tall and long limbed though, and my brother’s kids have those traits too. 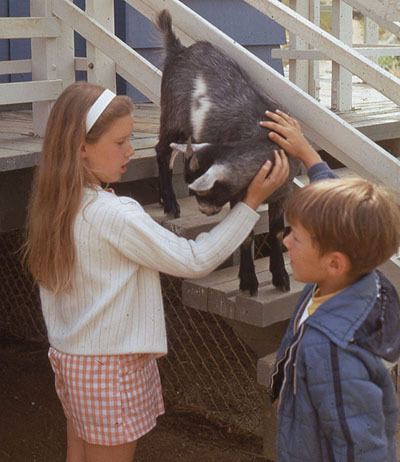 Looks like this picture was taken at a petting zoo (we loved animals as kids, and still do). It will be fun to see what other photos turn up as my parents work their way through the old slide trays. It’s wonderful that old slides can now be scanned in and saved. 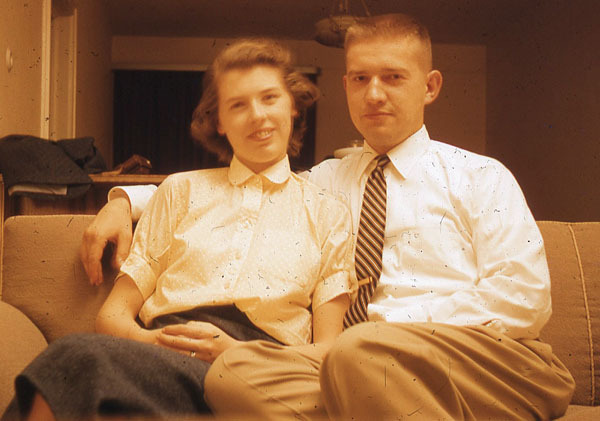 We had a lot of happy times as a family, and my brother and I have been very lucky to have the parents we did. The blog Cafleurebon posted a Mother’s Day story on the scents/smells that various perfumers associate with their Moms, and I was included. They’re also having a drawing in that post for a bottle of April Aromatics linden scent (which sounds lovely). Drawing for 3 Sample Sets! Let’s have a drawing for some sample sets now that Spiced Citrus Vetiver is out. I will have random.org draw 3 people to each win 4 carded samples. The winners will receive samples of Spiced Citrus Vetiver, Cocoa Sandalwood, and two samples of their choice. If you prefer, you can request a 3 ml mini spray of Spiced Citrus Vetiver plus a 1 ml sample of Cocoa Sandalwood instead of the 4 carded samples. Just leave a comment below to enter. Maybe tell us what’s blooming in your garden or neighborhood this spring, or tell us what notes you’d request in a new spring/summer scent. I’ll leave the drawing open for a few days. Thanks, and good luck! Just wanted to let you know that all sizes of Spiced Citrus Vetiver are on the site. I’ll post a drawing for samples of both all-natural scents on Thursday. We’ll pick 3 winners. You can enter drawings for samples of the new all-natural Spiced Citrus Vetiver plus other goodies on The Fragrant Man and Australian Perfume Junkies. Both blogs posted reviews and drawings today. Thanks so much, Brie, Jordan, and Portia!